Paleo Doritos Like Chips Recipe - Oh, The Things We'll Make! Crispy and coated with a tasty Mexican spice blend, these paleo Doritos like chips are a satisfying, healthy way to curb your junk food cravings. 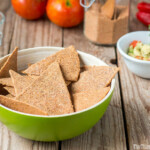 I've been making my own paleo tortilla chips from flaxseeds for a while now, and have to say that I really love them. 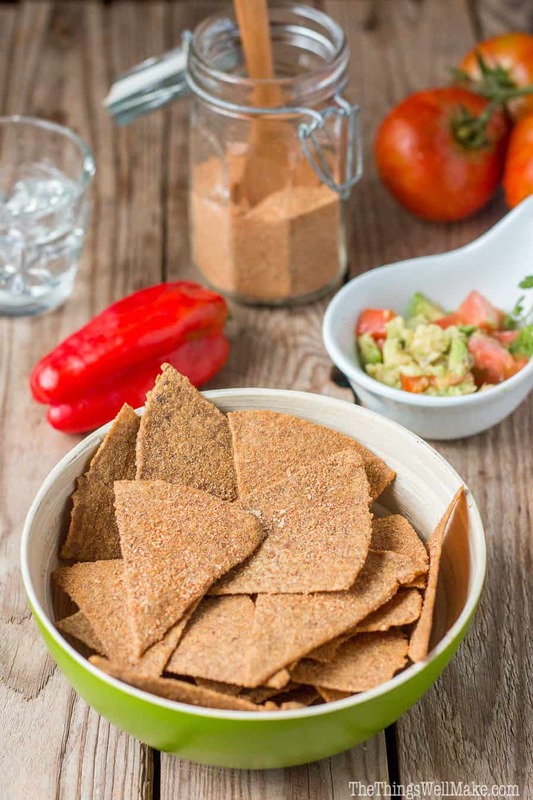 Once you make the tortilla chips (find the recipe for easy paleo tortilla chips here), it's really only a matter of making a spice mix that you enjoy. Doritos have a sort of Mexican spice blend flavoring that combines tomatoes, cheese, onions and garlic with spices often found in Mexican food like cumin and chili powder. I was out of cayenne powder, so I used a spicy paprika, and that worked out well for me, but you can easily substitute the spicy paprika for chili powder or a mix of sweet paprika and chili powder instead. You can also adjust any of the ingredients to your liking. Because flaxseeds have a good, healthy dose of fats, I didn't need to add any more oils to them to get the ingredients of the spice blend to stick. Basically all you have to do is to mix up all of the ingredients in a bag, throw some chips in there and shake the bag until the chips are well covered. That's all there is to it, and you can immediately enjoy the fruits of your labor. You may be surprised to find that it's incredibly simple and quick, and you can just as easily use the same recipe to make taco shells. Here is a video that shows how quick and easy it really is! With fall apples giving this coffee cake its moist texture, which contrasts with its crispy crumb topping, this paleo apple crumb cake is definitely one of my favorite paleo treats. 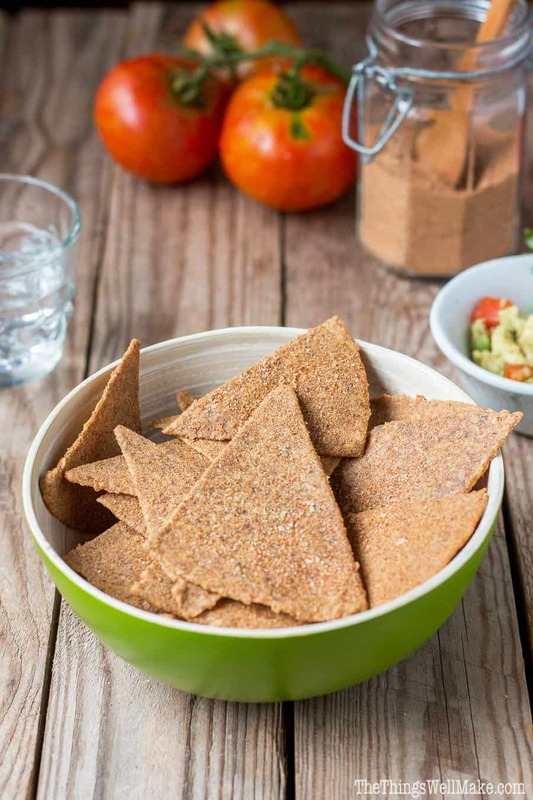 Make the paleo chips by following this <a href="https://thethingswellmake.com/flaxseed-paleo-tortilla-chips-and-taco-shells/">flaxseed tortilla chips recipe</a>. Mix together all of the spice blend ingredients. Make a fine powder that easily sticks to the chips by grinding the spice blend in a coffee grinder, spice grinder, or high powered blender. Fill a plastic bag or a large glass jar with the spice blend and the tortilla chips, and shake until the chips are fully coated with the spice blend. If your chips don't all fit in the bag or jar, work in smaller batches until you have coated all of the tortilla chips. I didn't have any problems coating the chips because of the fat content in the flaxseeds, but you can spritz them with a tiny bit of oil to get the coating to stick better if needed. Remove the chips from the bag or jar and serve immediately, or store them in a well sealed container until you are ready to eat them.